A popular grilling technique is adding smoke flavor to foods that have been grilled on a gas grill. Usually, the only smoke you get from a gas grill is from burning grease, which will not impart a tasty, smoky flavor into foods. With a little help from wood chips and some planning ahead, you can easily add smoky flavor to most grilled foods. It's important to note that if you want to add smoke when grilling, it takes time for foods to absorb the smoke flavor. If you are not planning on grilling your food for more than 20 to 30 minutes, it probably won't be worth the effort. If, on the other hand, the dish you are preparing is going to take more than 30 minutes on the grill (with the lid down), then you may want to consider adding smoke. In addition to the cooking time, the wood will need to be submerged in water until it is damp and soaked through. Make sure you plan on soaking time prior to cooking. Start with hard, dry wood like hickory, oak, mesquite, or cherry. Wood for smoking is usually precut into chips or smaller pieces, making it easy to manipulate. Soak the wood in water until fully saturated and then drain the wood. The pieces should be wet, but not dripping. Purchase a smoker box for the grill. This holds the wood chips in a container that sits on the grill and can easily be refilled or cleaned. Wrap the chips loosely in aluminum foil, creating a small pouch. Punch a few holes at the top of the pouch to let the smoke out and place the packet on the grill. 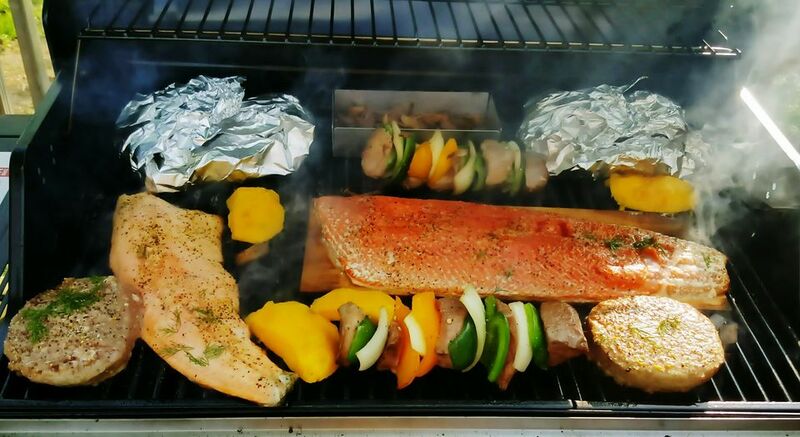 While the aluminum foil method is more economical, if you decide to use wood chips frequently on your gas grill, it may be worth investing in a smoker box. They are not very expensive and can be used again and again. Once you begin adding smoke and realize how easy it is, you are likely to want to do it every time you grill. To save time for your next barbeque, soak some wood chips and then place them in a resealable plastic bag and put it in the freezer. When you need wet wood chips for the grill, all you have to do is take them out of the freezer and put them in the smoker box or foil packet. Experiment with different types of wood as each has a different quality and brings specific tastes and aromas to the food. Apple and hickory tend to have the strongest flavors, while cherry and oak are known for being very mild.